The Ebro delta is actually just north of Valencia in Tarragona. 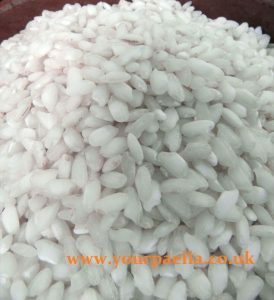 But Valencia has become closely associated with rice dishes made from the short grain Arborio rice which grows there. The most famous being Paella (Pie-ay-ah). “La Paella” is a cooking utensil, traditionally and preferably made of iron. The pan is circular and shallow with two round handles on opposite sides with a flat base of a good thickness. The word itself is old Valencian and probably has its roots in the Latin “patella” (A flat basket in Galicia). The Castillian “paila” and the French “paele” mean the same thing. During the centuries following the establishment of rice in Spain, the peasants of Valencia would use the paella pan to cook rice with easily available ingredients from the countryside: tomatoes, onions and snails. On special occasions rabbit or duck might be included, and the better-off could afford chicken. Little by little this “Valencian rice” became more widely known. By the end of the nineteenth century “paella valenciana” had established itself. It has become a custom at mass gatherings in the Valencian region (festivals, political campaigns, protests, etc.) to prepare enormous paellas, sometimes to win mention in the Guinness Book of World Records. 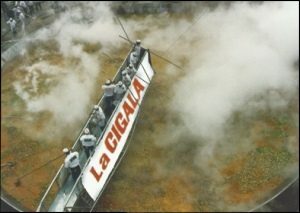 Chefs use gargantuan paelleras for these events. Each year chefs from the region of Galicia compete for the title of “Paella King”. The competition is held in a different town each year in that region. 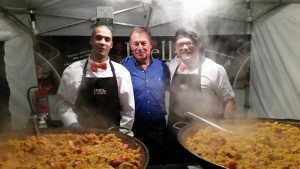 Valencian restaurateur Juan Galbis and a team of helpers, made the world’s largest paella in 2001 and then fed it to about 110,000 people according to Galbis’s website. This paella was even larger than Galbis’s earlier world-record paella made in March of 1992 which fed about 100,000 people. 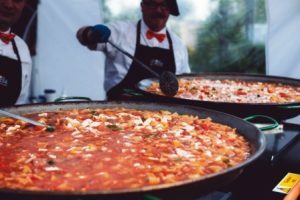 Galbis’s record-breaking 1992 paella is listed in Guinness book of world records. Eventually, Spaniards outside of the Valencian region saw the charm in this dish. Coastal residents began adding seafood to the traditional recipe and called it mixed paella. Mixed paella then became popular outside of Spain. As other cultures set out to make paella, the dish invariably acquired regional influences. Consequently, paella went from being a relatively simple dish of rice, beans, meat and green vegetables to including fresh seafood, meat, various types of sausage (the most popular being Spanish chorizo, a wide range of vegetables and many different seasonings. However, the most globally popular recipe is seafood paella. In Spain, mixed paella is very popular. Some restaurants that serve this mixed version refer to it as Valencian paella but Valencians insist only the original Valencian recipe can bear the name paella valenciana. 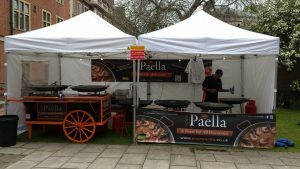 https://www.yourpaella.co.uk/wp-content/uploads/2014/07/Paella-Copy-2.jpg 1085 1367 Gary Evans https://www.yourpaella.co.uk/wp-content/uploads/2019/01/logotrans1-300x106-300x106.png Gary Evans2013-03-04 17:00:592017-06-01 16:55:28Paella and its history. 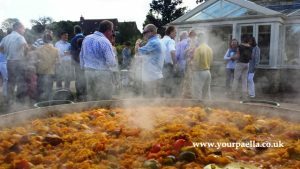 Have you ever been to a party where the caterers are cooking on a big Paella pan? Its a very impressive sight. Its even more impressive when 2 or more big Paella pans are being cooked on at the same time! 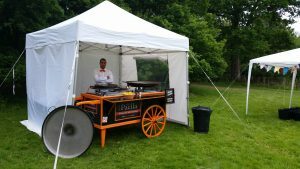 That’s exactly what Your Paella, the Paella catering specialists do. From the site of the BIG Paella pans, to the beautiful aromas that are created whilst the delicious Paella’s are being cooked. Paella really is THE hot food choice for any social gathering. From weddings to public shows and events, birthday parties and corporate events. Cooking on big Paella pan’s isn’t easy and its not really a good idea to try and cook in a big Paella pan until you have mastered the art of cooking Paella in a much smaller pan a few times first. If your a lover of food like I am, then I really would suggest that you buy a small Paella pan and have a go at cooking your own Paella. 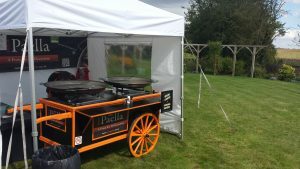 You may want to check out our online shop www.yourpaella.co.uk and see if we have received our stock of Paella pans, legs and burners yet. If not just bookmark the page and check back later. 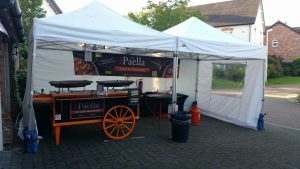 You could also “Like” our Facebook page www.facebook.com/yourpaella then you will receive all our latest updates and any special offers we have. So how hard is it to cook your first Paella? If your used to preparing food and cooking, then not hard at all I would say. 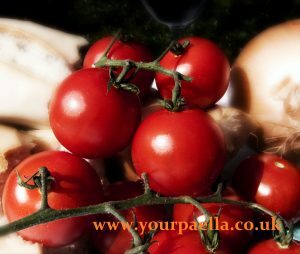 Its all about having the right Paella pan and really good ingredients. 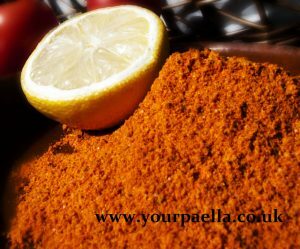 When Your Paella cook Paella, we use, extra virgin olive oil, onions, tomato, Chicken, Spanish Chorizo sausage, mixed shellfish, red pepper, garlic, stock, Paella rice and Your Paella’s seasoning. We don’t add the shells when we cook Paella so the guests don’t get covered in it while trying to de-shell the prawns etc. 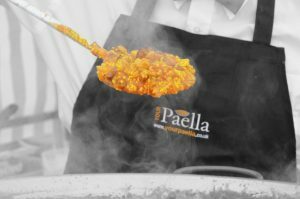 Now if your ready to cook a Paella of your own, take a look around the Your Paella Blog, its full of information and videos to help you cook the perfect Paella!